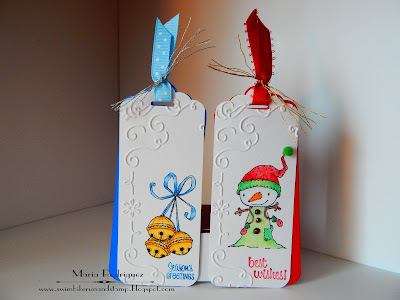 Hello everyone: With Christmas just around the corner, here at SHOPPING OUR STASH we want you to make some tags for all those gifts for family and friends that will go under your tree. 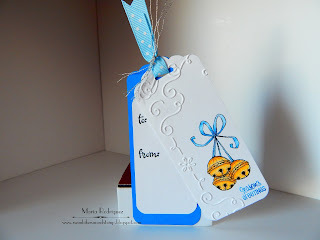 Tags are quick and easy to make, choose a pretty stamp and a sweet sentiment, use a die or a punch for the tag, string a festive ribbon and you are done. Here is a couple of tags I made, hope it inspires you to make some and share them in our gallery. First I punched the tags with the Stampin' Up! 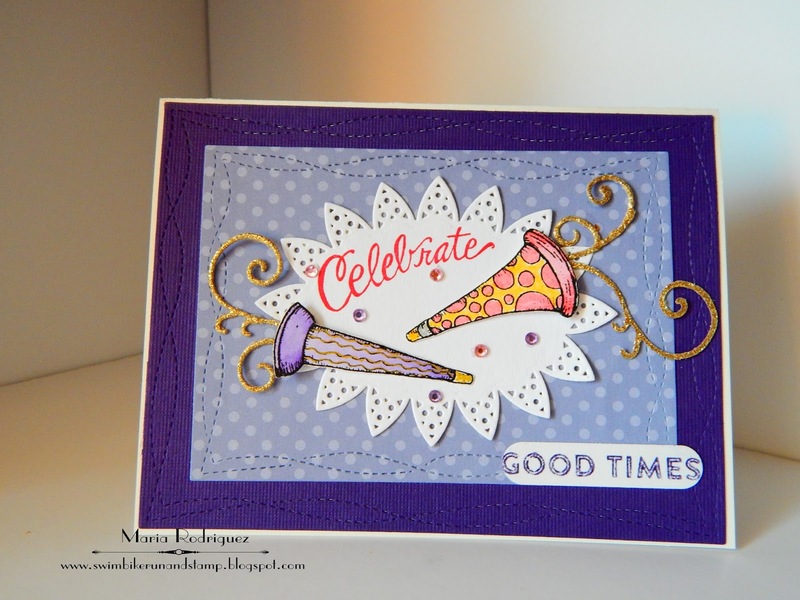 Scalloped Punch, I then embossed the left side with the retired Stampin' Up! Filigree Frame embossing folder and then, stamped my little images from the Stacey Yacula collection from Purple Onion Designs. 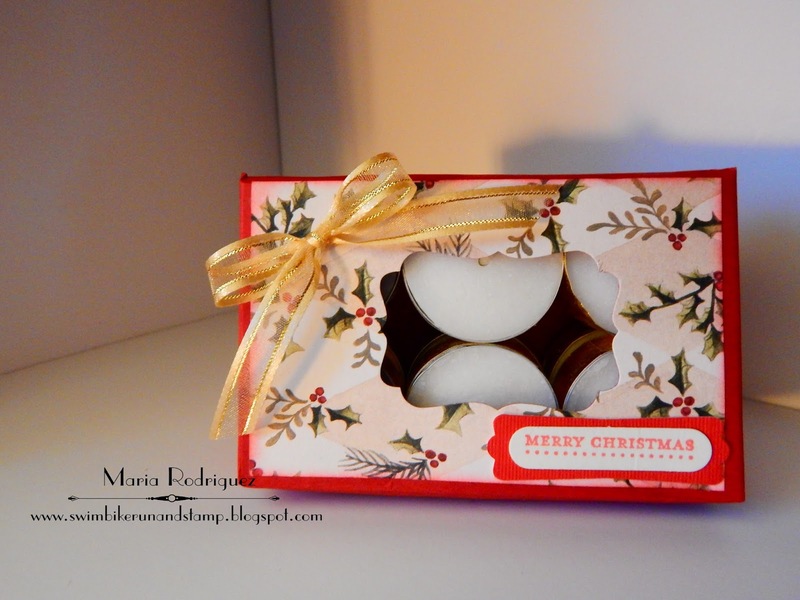 Both the Jingle Bells and the Winterberry Small Snowman were stamped with Stazon black ink and colored with Prismacolor pencils and paper stumps dipped in baby oil. 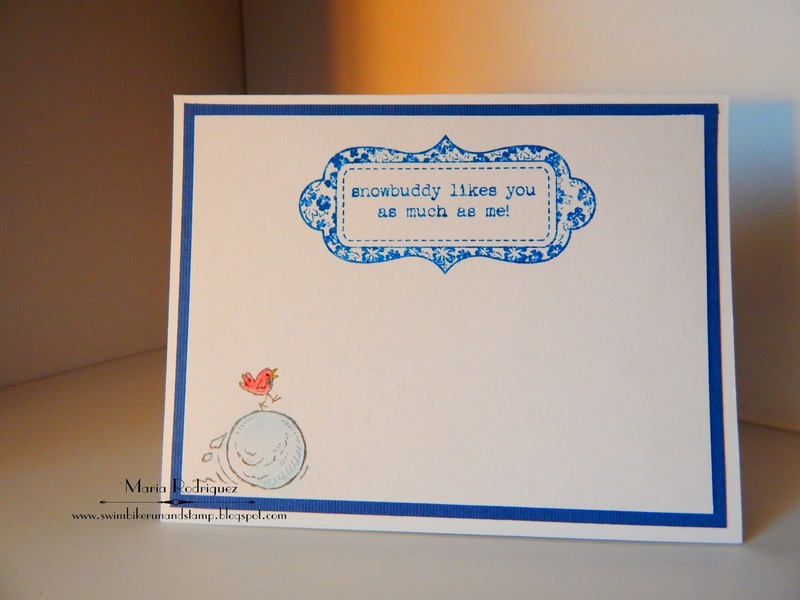 The sentiments are from the same collection. 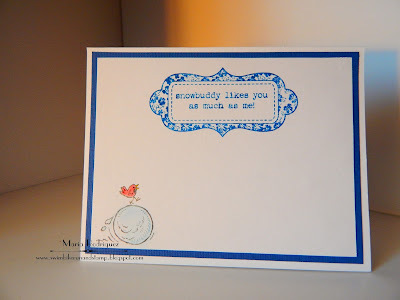 I punched a separate tag in red and blue as a background and I added a little white piece of card stock to write something. The ribbon is from my bottomless drawer and so is the metallic thread, I have a huge stash of this threads so I need to use them more. 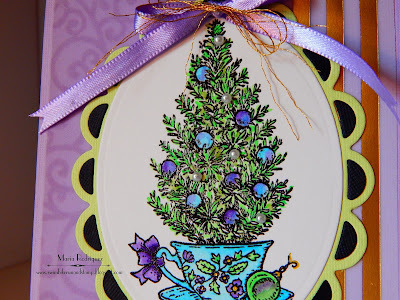 Feel free to make any kinds of tags, they don't necessarily have to be for the Holidays, I just made these because I've been neglecting my Purple Onion stamps, they are so beautiful so I really don't know why I've been forgetting them. This is the purpose of this challenge, to go dig out your neglected stuff, whether it's papers, embellishment, stamps, punches or dies, go on and Shop YOUR Stash and join us in the gallery and, while you're there, check out my teammates awesome tags so you can get even more inspired. 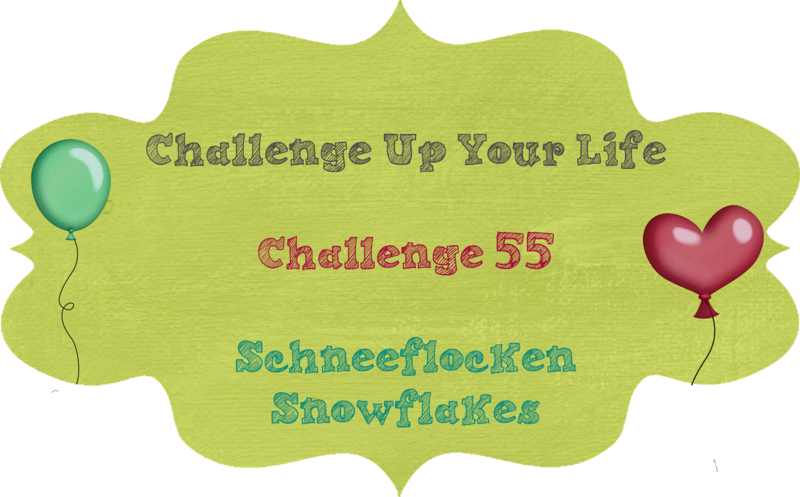 I would like to link this tags to the following challenges. 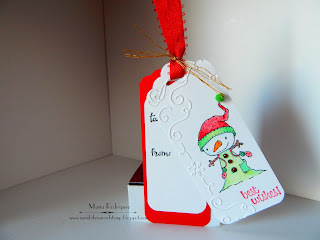 Make My Monday Challenge #36 "Show me a Snowman"
Dream Valley Challenge #146 "Christmas"
Scrapbook Stamp Society Challenge #106 "Anything Goes, option "Christmas"
Hello everyone: This post is super late, I usually do my posts in the morning but I had some last minute shopping to do for my grandchildren so, it was totally necessary to venture out, although the moment I arrived at the Mall, I almost turned around, the parking lot looked like they were giving away the merchandise, sheeesh!! 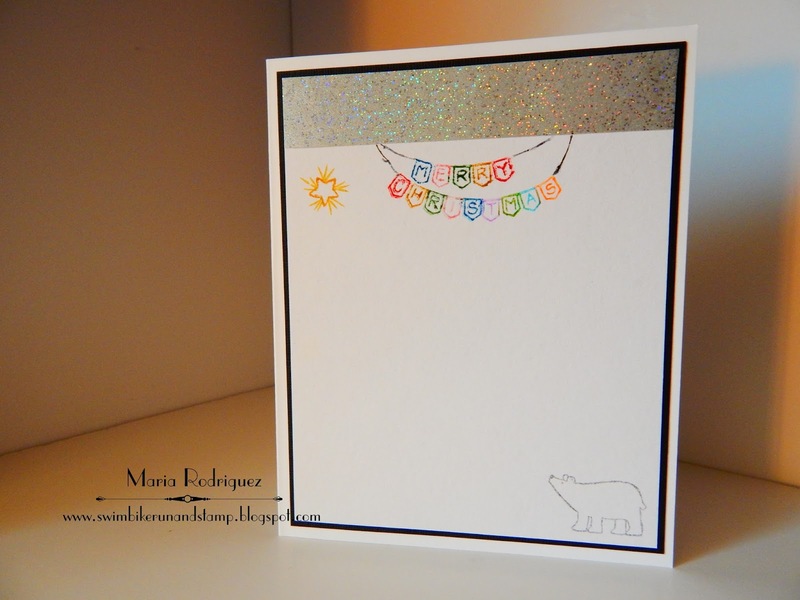 But anyway, I have this quick card I whipped out a bit before I left, I just needed to take the pictures so I waited for the sun to come out to do that, it was really gray this morning. 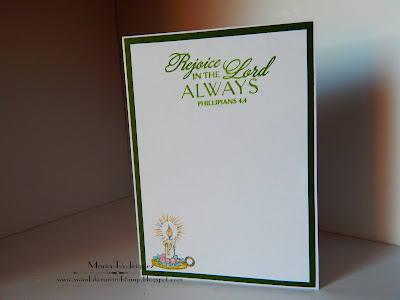 I will link up this card to a few challenges at the end of this post. 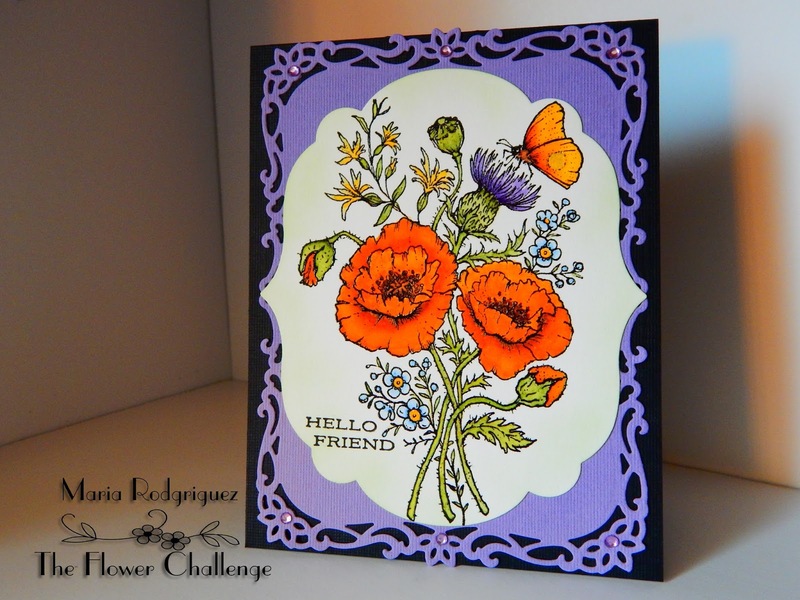 This images are from the new Power Poppy by Marcella Hawley set calledWreaths Plain and Fancy, I stamped it onto plain white card stock with Stazon black ink and colored it with Prismacolor Pencils, I added a bit of spark with Dazzling Diamonds. The sentiment is from another amazing Power Poppy set called O Holy Night, and it was heat embossed in gold. 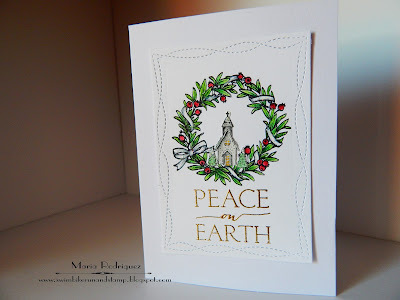 The sentiment is from the set "O Holy Night" and the little candle is from another Power Poppy set called Merry Littles, which is my "go to" set to adorn the inside of my cards. 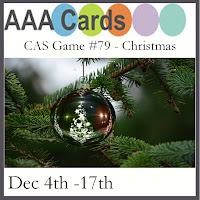 Crafting When We Can challenge #134 "It's Christmas"
AAA Cards CAS game #79 "Christmas"
Hello everyone: Every year, a little before the Holiday season starts, Brian King organizes a Holiday card swap for all of his blog followers, he asks us to make a card, using current SU products as much as possible and send it to him, along with a self addressed and stamped envelope, at his house, where he takes pictures of all the cards, mix them up and sends them back to all of us who participated, it's fun to receive a beautiful card from far away, thanks to him. 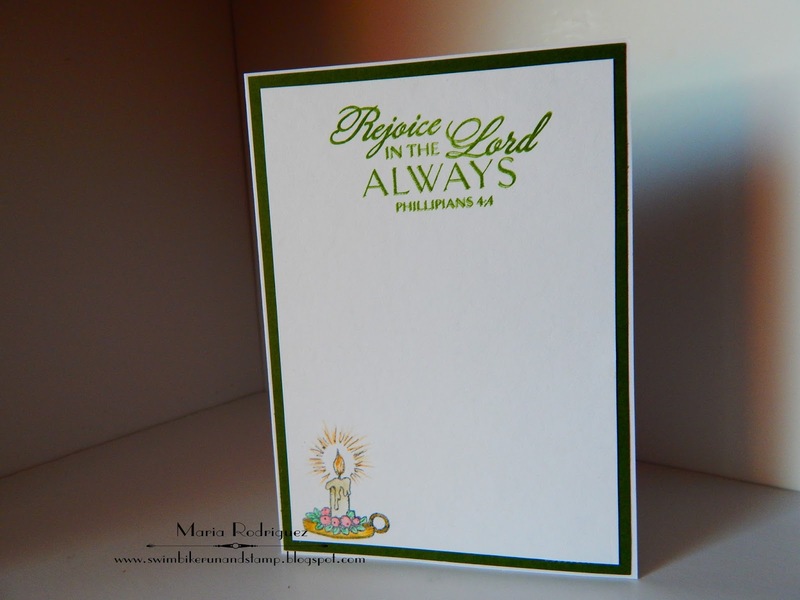 Then, at a later date, he starts sharing all of the cards that arrived in his overflowing mail box, with us on his blog. 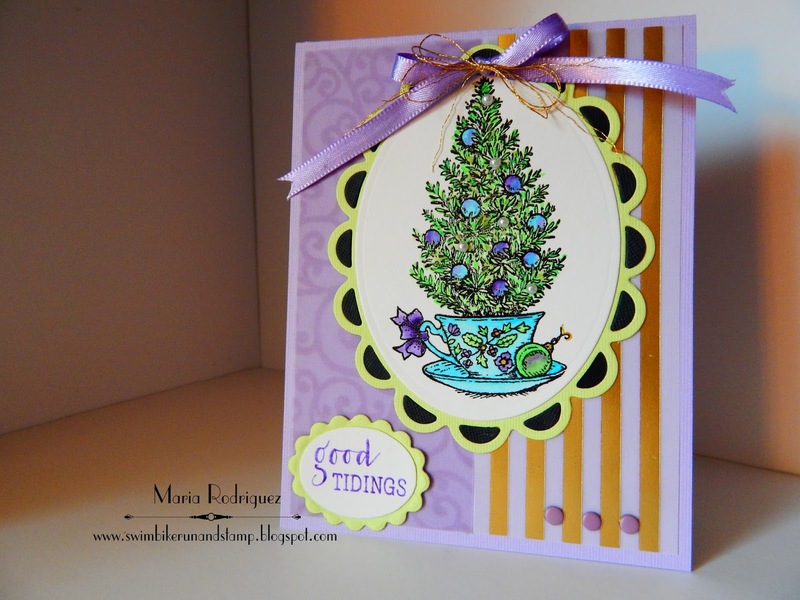 It's so much fun seeing all of this beautiful cards on parade, where we can appreciate and get inspired by all of them, this is the card I sent, using the new Father Christmas stamp set and the Pretty Pines Thinlits Dies, I love, love both of this beautiful sets. I used the Birch embossing folder on a panel of Cherry Cobbler card stock, added a strip of retired SU gold embossed vellum from the Winter Wonderland Designer Paper Stack, die cut the pine branches, pine cones and bows with the Pretty Pines dies and added a bit of Dazzling Diamonds for a bit of sparkle. 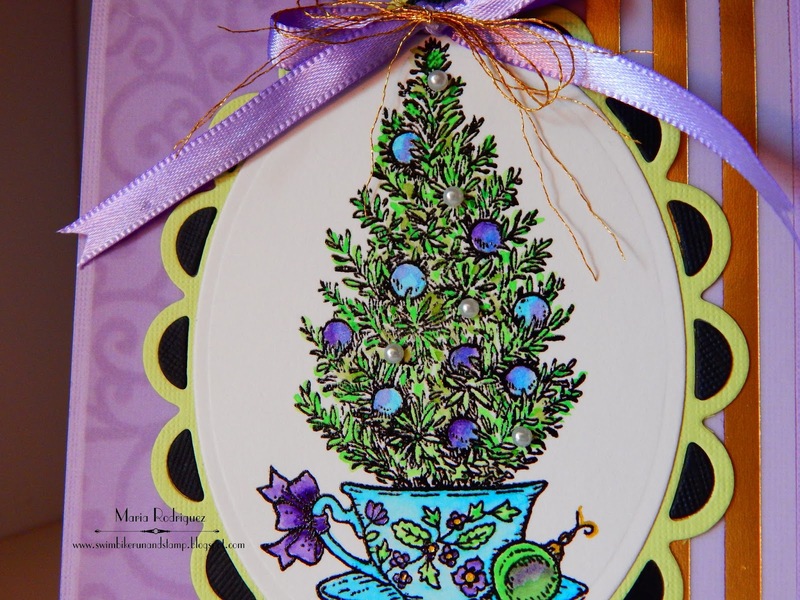 The beautiful Santa image was stamped onto a piece of Strathmore multi media paper and colored with SU markers and an aqua painter, I added a few little Rhine Stones to the Christmas Tree as ornaments. 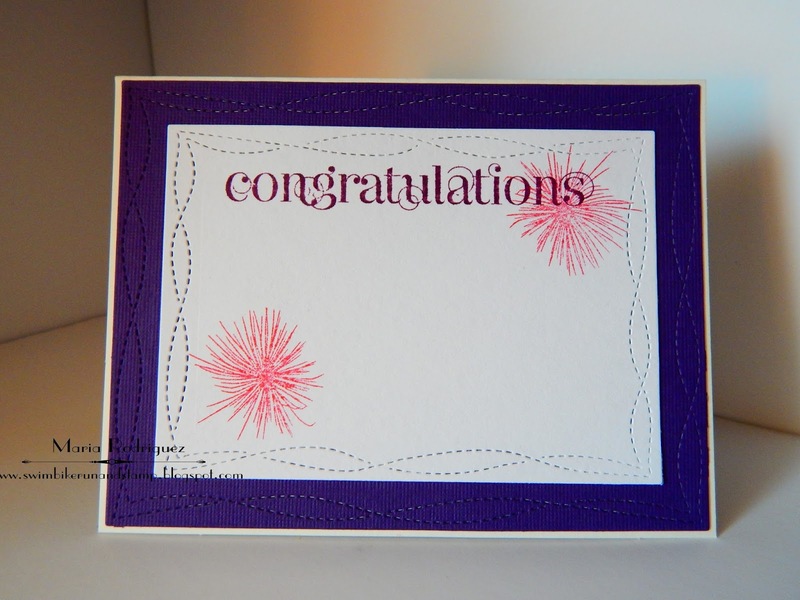 Here is a picture of the finished inside of my card. 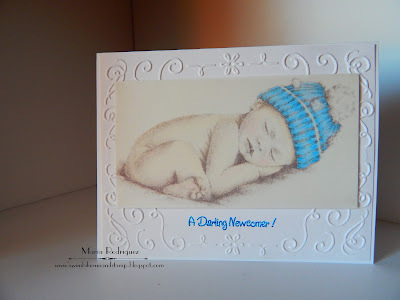 This stamps are part of this beautiful set. TIME OUT CHALLENGES #71 "Christmas with an optional twist of glimmer/shimmer"
Moving Along With The Times challenge #34 "Anything Goes with Christmas"
Creative Knockouts challenge #169 "Tis the Season"
CRAFT ROCKET CHALLENGES #29 "Winter Time"
As You Like It "Favorite Christmas color combination and why?" Love the traditional Christmas colors of red, green and gold. 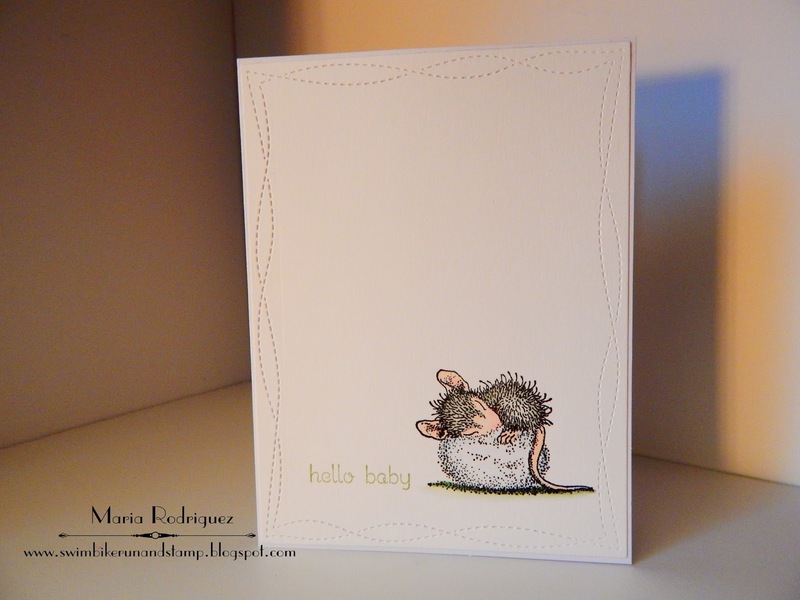 Hello everyone: I have another card made with my absolutely favorite little critters, the House Mouse siblings, this one is a CAS card, (hope I'm right). 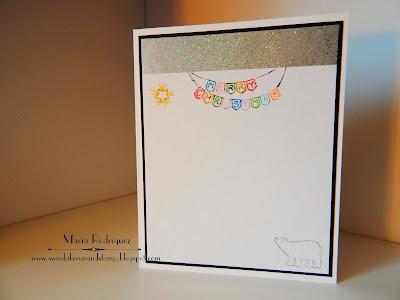 As I read the definition of CAS this types of cards should have lots of open space, minimum layers and embellishments and should be easily reproduced once you have the design so, for me, this card was super easy to make. 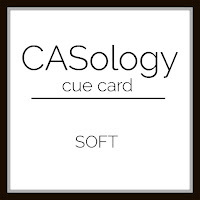 I'm entering this card to the CASology Challenge, Week#225, with THE CUE WORD "SOFT". 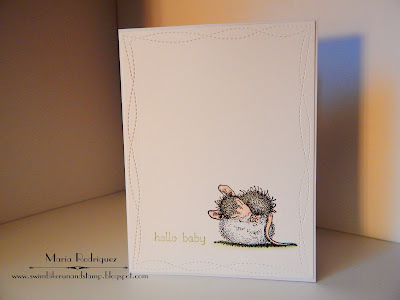 When I saw CASology's new challenge, my mind immediately geared towards this little image, perhaps because of the puffy cotton ball this sweetie is sleeping on, or perhaps because this little mouse is pure softness on it's own. 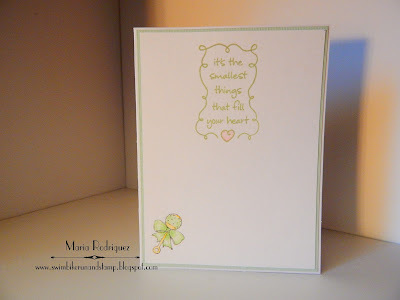 I die cut a panel of Strathmore multi media paper and die cut it with THIS Wonky Stitched Dies by Gina Marie Designs, then I stamped my little mouse with Versafine black ink and clear heat embossed it, colored it with SU markers and an aqua painter, the sentiment is from SU Teeny, Tiny Wishes, inked up with Certainly Celery. The sentiment is from my stash, the little baby rattle is from a retired Flourishes set called "Baby Love"
I will link up this card to the following challenges. Die Cutting Divas Challenge #293 "Anything Goes" with a die. Lemon Shortbread Challenge #29 "Anything Goes"
Sunny Day Crafting Challenge #24 "Anything Goes"
Thank you for stopping by, I always read every comment you so kindly leave on my posts, I want you to know I appreciate this more than words can express. 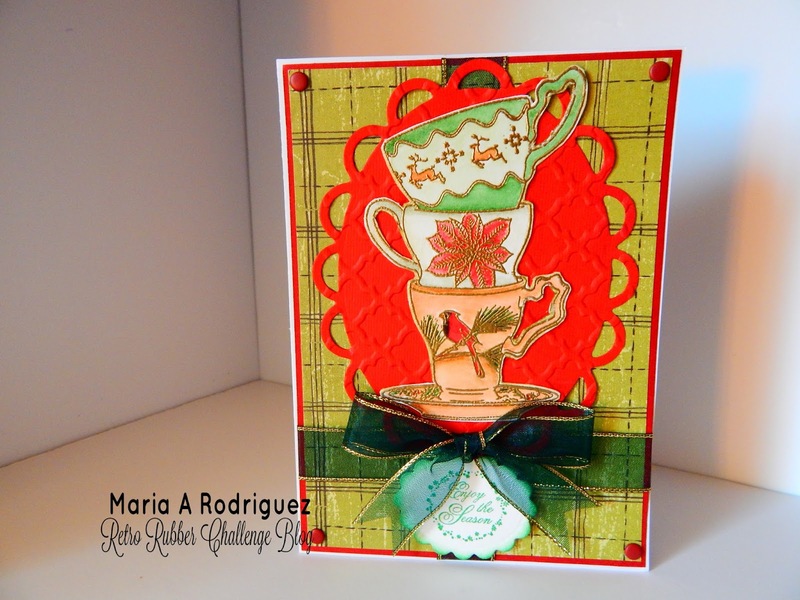 Hello everyone: The RETRO RUBBER challenge is back, this time it's a fabulous sketch that will spark your imagination and allow you to create something fabulous and join us in the gallery. 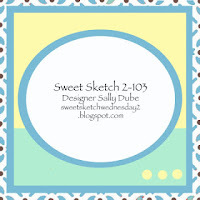 I think Sketches are up there in the favorite challenges category with the "Anything Goes" ones because you can really fill the spaces with anything you want, you can even turn the sketch on it's head and/or use it horizontally, it 's up to you so, come along and play with us, we can't wait to see what you create. 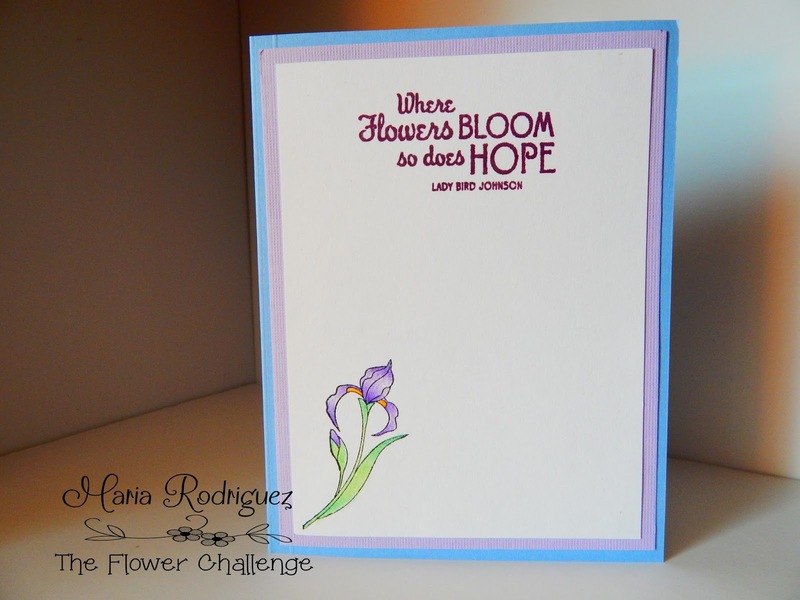 This is my inspiration card for you and, for even more inspiration, hop over my teammates' blogs to see the wonderful projects they made. This image is truly Vintage, both in look and age. 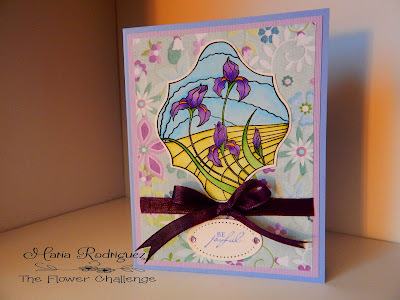 The stamp set was from Flourishes and it's called "Petals and Peace" and it was issued around November of 2012. 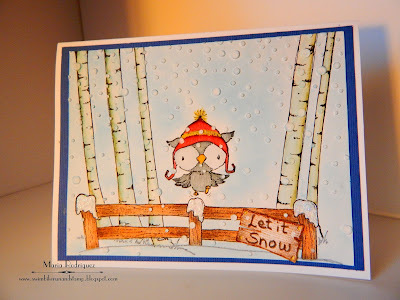 I stamped this image onto a panel of Strathmore multi media paper with Versafine black ink and clear heat embossed it, then I colored it with my SU markers and an aqua painter. The bells are colored with a gold gel pen. After I finished coloring it, I fussy cut it. 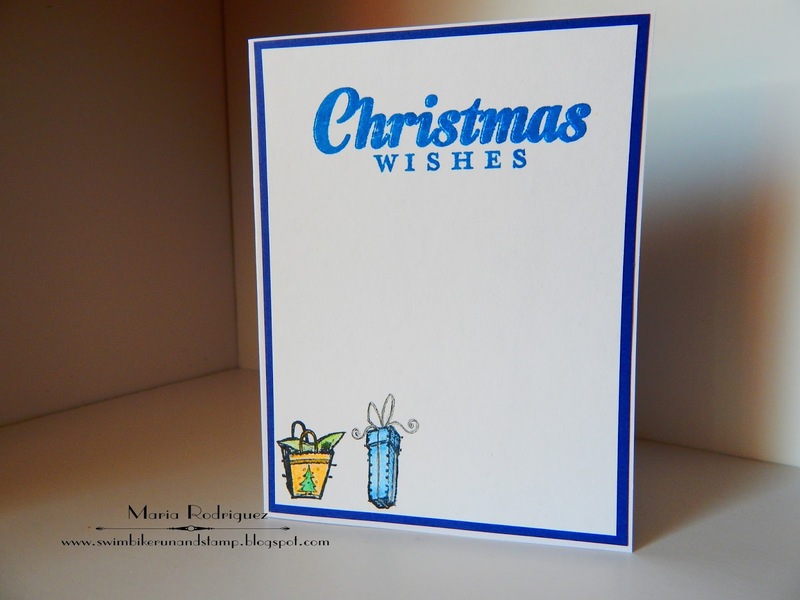 I picked up the colors of the pattern paper to choose my card stock, I really love this one sided paper, I'm down to a few pieces so I think it's time to get some more. 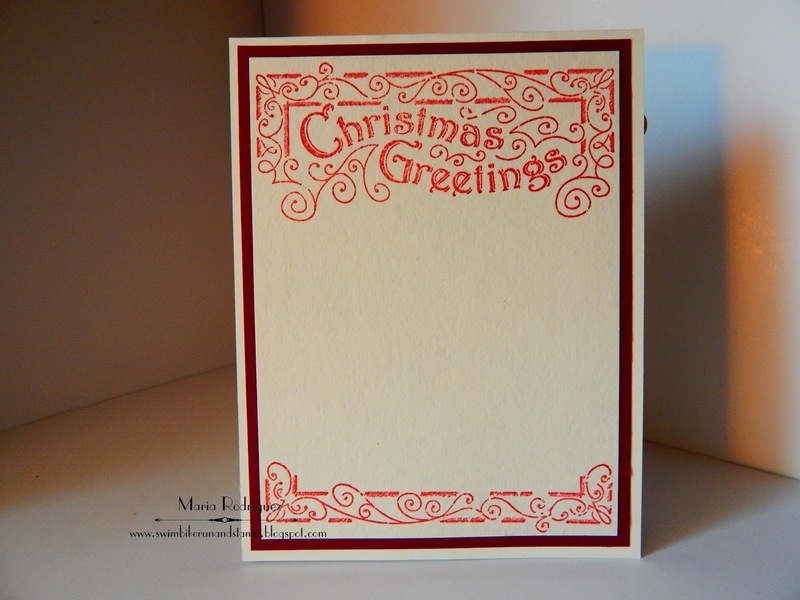 The Sentiment is from another very old Flourishes set called "Sentimental Christmas" that dates way back in November of 2011. I usually find out the age of my stamps by visiting Splitcoaststampers, if you know the name of your sets, this is a great place to find the first time they were used. Another great way is through Pinterest browsing the name of the set you will find cards made with it and, by visiting the blogs of the creators of those cards, you can more or less, see the date when they were used. Remember that at Retro Rubber one of the rules is for you to please tell us the age of your stamp sets, or at least, how long you've had them. Here is the fabulous sketch for you to enjoy. 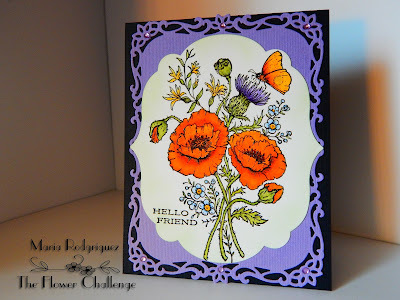 The sentiment is from Power Poppy by Marcella Hawley's Ponsettia that was issued for the first time back in 2014 and that is how long I've had it. The little present on the corner is from another Power Poppy set called Merry Littles which contains a fabulous array of super sweet and cute little images to adorn the front or the inside of your Holiday cards, this is my go to set for finishing the inside. I hope you like this card and join me and my fabulous teammates in our gallery. 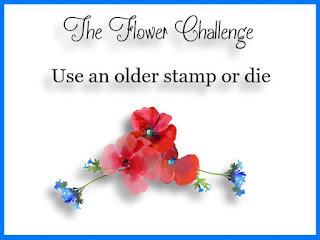 Please remember to read our rules, they are few but important, the two main ones are: 1.- the stamps you use MUST be at least one year old and 2.- you can only link up to a maximum of 10 challenges, including ours. 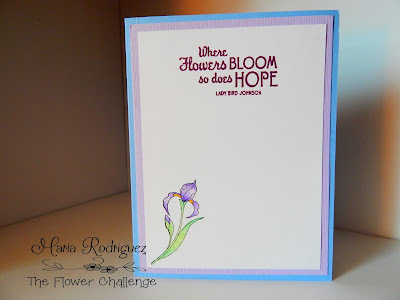 For even more amazing inspiration, hop over my teamies blogs and check out their awesome projects. Hello everyone: Here we are with a new challenge for you to try over at Shopping Our Stash , with the days getting chilly and Christmas just about a month away, I made this card to add to my stash of Holiday cards and to inspire you to do the same and then, join us in the gallery. I hope you like it. This image is from a set from Power Poppy by Marcella Hawley called Bough Wow Wow and it's indeed a WOW set. This thick and warm mittens just invite you to wear them, specially if they are knitted by your grandma, ask me how I know that! I stamped the image onto a panel of Strathmore multi media paper and colored it with SU markers and the aqua painter, I added some shadows with Prismacolor pencils and a bit of sparkle to the puffs with Dazzling Diamonds. The banner is from a super old set by Spellbinders called Ribbon Banners, the sentiment was stamped using an old Flourishes set called "Sentimental Christmas", love this photopolymer stamps because they are so pliable and you can bend them like I did here to fit the curve of the banner. I found some silver metallic thread and wrapped it around the punched corners of the panel to further frame this pretty image. 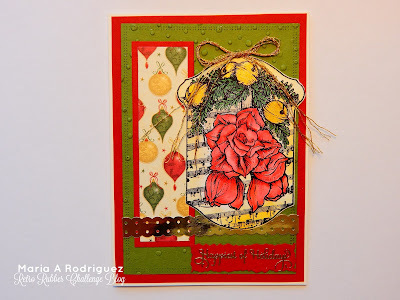 The sentiment is from a Power Poppy set called Spice it Up, the Poinsettia is from Merry Littles. I hope you get inspired and join me and my teammates in our gallery. 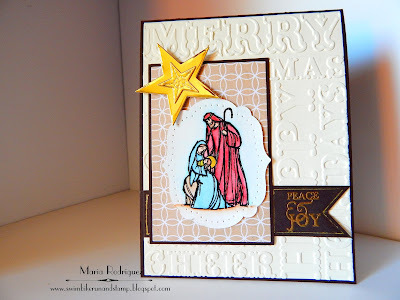 For more awesome inspiration, jump to their blogs to see their awesome creations. Hello everyone: Well, November is winding down, Thanksgiving is near and I'm looking forward to the rest of the Holiday season. 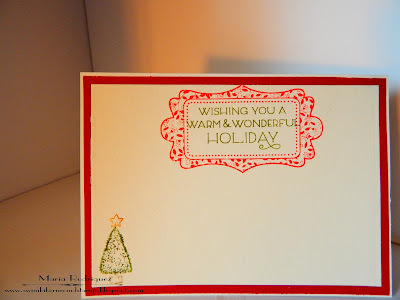 I need a few more Christmas cards so I made this one with one of the prettiest Stampin' Up! 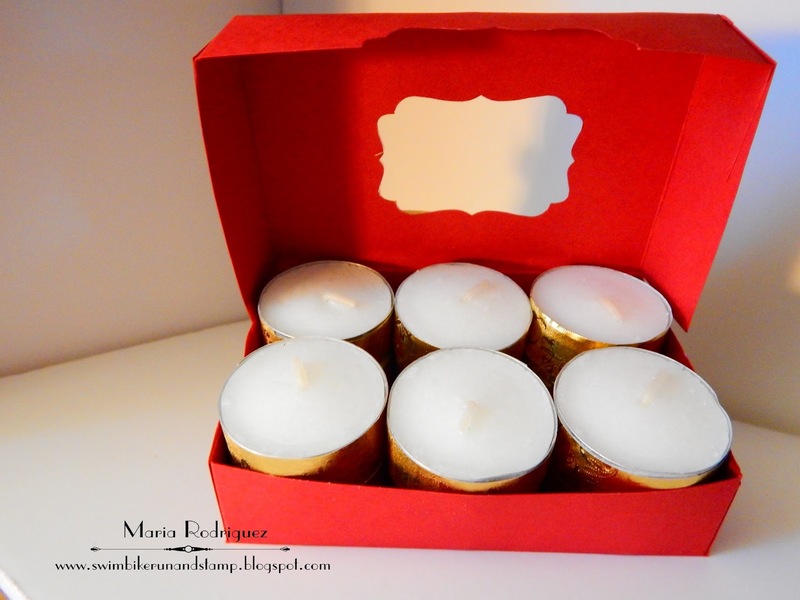 Christmas sets from last years Holiday catalog. I will link this card to a few challenges at the end of this post. The set is called "All Ye Faithful....." and the images are beautiful and super easy to color. 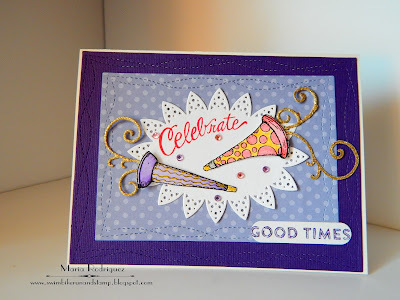 I stamped this image onto a water color die cut with Versafine black ink and clear heat embossed it, then colored it with SU markers and an aqua painter. 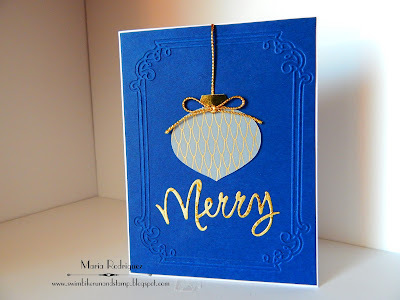 The patter paper is from my stash and so is the die cut golden star, the sentiment is from an old Flourishes set and it's heat embossed in gold. 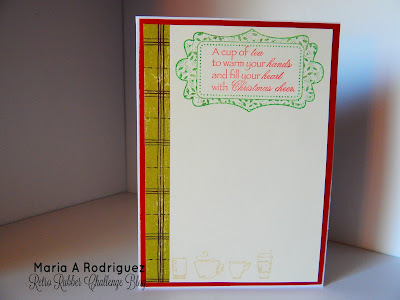 The embossed panel on the back is done with a Sizzix embossing folder. 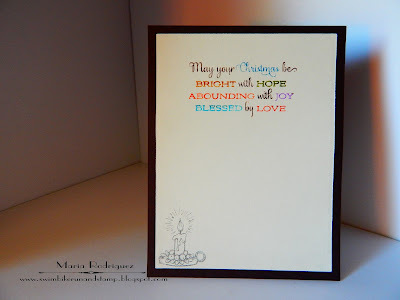 The sentiment is stamped using several SU markers, the little candle in the corner is from a Power Poppy set called Merry Littles. 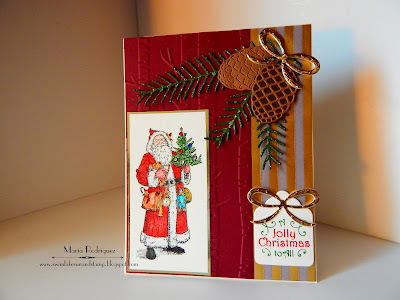 The Penny Black November Challenge "Anything Goes Christmas"
Stamping Sensations Challenge "Christmas Greetings"
Lil Patch of Crafty Friends Challenge #46 "Anything Goes"